The insult of “walking simulator,” lobbed at video games whose strongest elements are exploration, discovery, and story, misses its intended target. It conjures something more like Bennett Foddy’s QWOP. Then again, we all know what the term means by now: something like Gone Home that removes the elements of puzzling and physical challenge from an interactive space. So let’s be upfront about this: Everybody’s Gone to the Rapture is most definitely a walking simulator, even if I’m not entirely certain that I did any walking during the almost six hours that I spent with it. And it’s a very good one, too. The verbs in the game are limited. You can move, using the left stick on your PlayStation controller. You can look, with the right stick. You can push open unlocked doors and gates, with a button press. You can start playing recorded messages—on phones, on radios, on tape decks—with the same button. And you can move balls of light in the air (until they explode into a conversation among the vanished inhabitants of the English countryside that you’re exploring) by tilting the controller. That’s it. With that limited vocabulary, however, The Chinese Room—who gave us the prototypical walking simulator, 2012’s Dear Esther—have created a game that is, forgive me, enrapturing. It’s a testament to the game’s achievement, although also an indictment of its niggling flaws, that I would happily play Everybody’s Gone to the Rapture again, even as I don’t understand who I was in the game, nor why I was sauntering—or was I floating?—through its majestic landscape as I listened to haunting, church-like music, nor what exactly happened in England’s Yaughton Valley to make everyone disappear in the 1980s. I’m not sure all the answers are in the light, but some of them are, and as with any good mystery, many of them bring more questions. What happened to Katherine Collins is the throughline of Everybody’s Gone to the Rapture, but along the way the plot resembles that of an ensemble TV series, as you follow the stories of a village priest, a retired busybody, a farmer, a camp proprietor, and an astrophysicist. These vignettes help reveal the main plot but they also contain their own, unrelated dramas. The writing, on occasion, is either too opaque or too obvious, but I became attached to the characters and was moved by their fates. The countryside in the game is large and open, and the story unfolds at the pace and direction of the player’s choosing. At the outset, I feared I would be lost, and I was momentarily overwhelmed by a fork in the road that branched off in three directions. Fortunately, a comet-like light zooms and swoops through the game. You can ignore it, but I was happy for the guidance. It serves as a kind of in-game docent, leading you toward undiscovered elements or tracing you back toward stories that you missed. Over time, the game’s visual language becomes easy to interpret. Closed doors are almost always locked, while slightly cracked ones are pretty much always worth opening. Taking a side path off the main route typically leads to a new discovery while also circling you back, close to your starting point without the need for backtracking. The pretty scenery contrasts with the sadness of abandoned bicycles, luggage, and toys, of bloody Kleenexes next to a keyboard, or an arm brace on the grass. Periodic maps of the valley with “You are here” markers provide a useful fictional substitute for a percentage measurement of in-game progress. Although the game evokes a strong sense of place—you feel like you are genuinely walking through an idyllic English valley—it is less good at capturing the period of the early 1980s. We see the occasional tape deck or CRT monitor, and even a Rubik’s cube, but Everybody’s Gone to the Rapture does not feature the dense pop-culture allusions that rooted Gone Home so powerfully in a specific era. This is a fine game, easily one of the best I have played this year. Even so, the philosophizing at the end eluded me, although perhaps it was meant to. Somebody will probably solve the mystery and share the answers, and perhaps then I will like the game less. 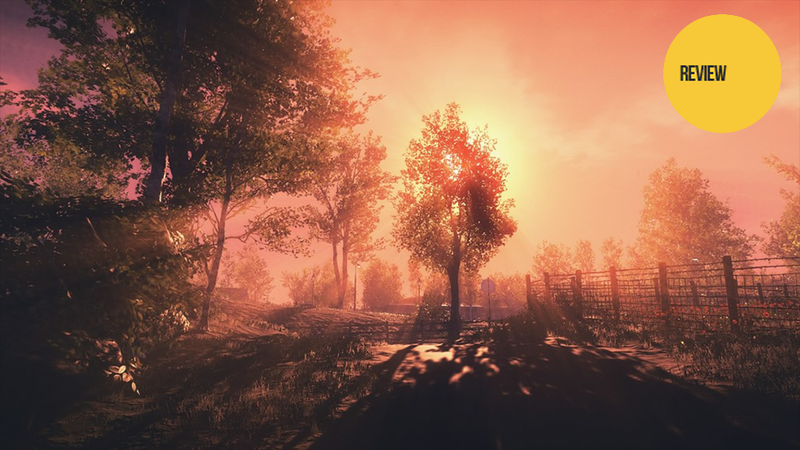 Everybody’s Gone to the Rapture is a creature I fear will be killed if I crack it open to examine its entrails. This is a game about an empty world that was once full, about the traces we leave behind us, about our attempts to reach out and connect with each other, about our straining efforts to grasp the meaning and nature of our place in the universe. The religious overtone of “rapture” in the title is impossible to miss, but I suspect the game intends to convey a more literal meaning: “of intense pleasure or joy.” Still, playing Everybody’s Gone to the Rapture gave me the sensation of hearing a Gregorian chant or of watching sunlight bend through stained glass, the ecstasy of mystery.